On Wednesday, The Weeknd released a single featuring Daft Punk called "Starboy." The single could not have come out at a more appropriate time, and no I don't just mean because fans have been waiting for the 26-year-old artist to put out new music. It's very timely due to the fact that The Weeknd's "Starboy" mentions Brad Pitt, who is all over entertainment news recently thanks to his divorce from Angelina Jolie. Upon listening to it Thursday morning, I did a double take at the Pitt name drop. At first, I thought I misheard The Weeknd or was just delirious thanks to being tired, but after rewinding the track, I definitely wasn't mistaken. The actor is very much a part of the song, but why? There could actually be several meanings behind that Pitt lyric in "Starboy." Bustle has reached out to The Weeknd's rep regarding the inclusion of the lyric and the timing of the song's release, but has not yet received a response. 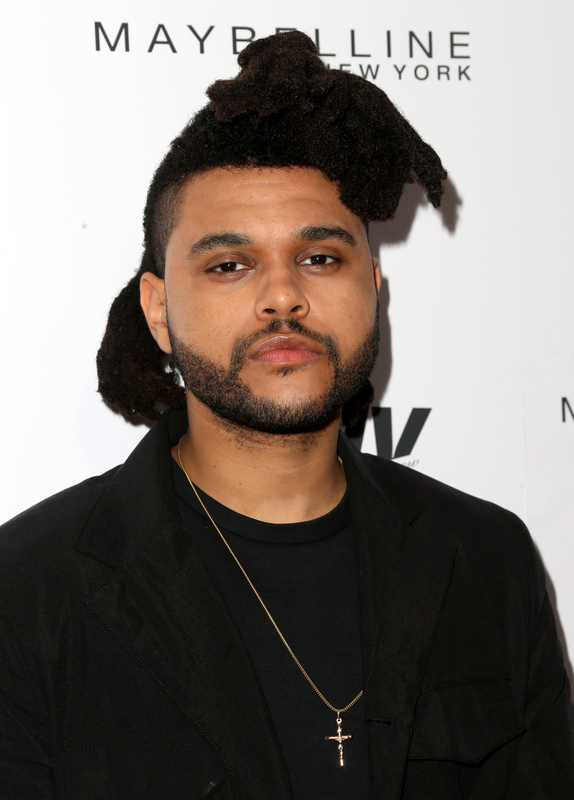 The Weeknd sings, "Let a n*gga Brad Pitt / Legend of the fall took the year like a bandit." If you want to listen to the track in its entirety and to hear The Weeknd drop Pitt's name, head on over to Spotify or Apple Music and scroll to the 2:20 mark. It's a quick reference, but still big enough that it's getting people talking. There are even some questioning why "Starboy" was released when it was. The single came out only a few hours after The Weeknd announced his third studio album, which is also titled Starboy. Alongside his announcement, he even debuted a new haircut and the cover art for his album. Before fans could come down from their high over the exciting news, the "Starboy" single was released. Was this always his intention? Did he push it out sooner because of the Pitt and Angelina Jolie divorce news? It's unclear, but there's no questioning that it's interesting timing. Maybe it's just one big coincidence. This could've been his plan all along, plus as The Weeknd tweeted Wednesday, "I come alive in the fall." Seeing as Sept. 22, 2016 is the first day of fall, it makes sense for him to release a new single then, especially one with a lyric that references the season. Now, let's get to the reason behind including Pitt. What seems like the most logical explanation is that The Weeknd is fan of the Oscar-winning actor. His "Legend of the fall" lyric refers to Pitt's 1994 film Legends of the Fall. The release year for that movie was also a huge year for Pitt. Interview With the Vampire came out too, which put him on the map. After that, Pitt was be seen in 1995's Se7en and Twelve Monkeys. So, it's most likely that The Weeknd respects Pitt's work in 1994 and that's why he included him in "Starboy." When he sings "took the year like a bandit," it could also be The Weeknd's way of saying that both he and Pitt had breakout years. Maybe The Weeknd is making a comparison between Pitt in 1994 and himself in 2015, which is the year the singer became a huge star thanks to his album Beauty Behind the Madness and hits like, "The Hills," "Can't Feel My Face," and "Earned It." Or, maybe I'm reading too much into it and The Weeknd wanted to honor Pitt and show his respect by including him in one of his songs. Whatever the true reason, "Starboy" couldn't have come out at a more perfect time and is probably going to be a huge success — and maybe even thanks to that lyric.